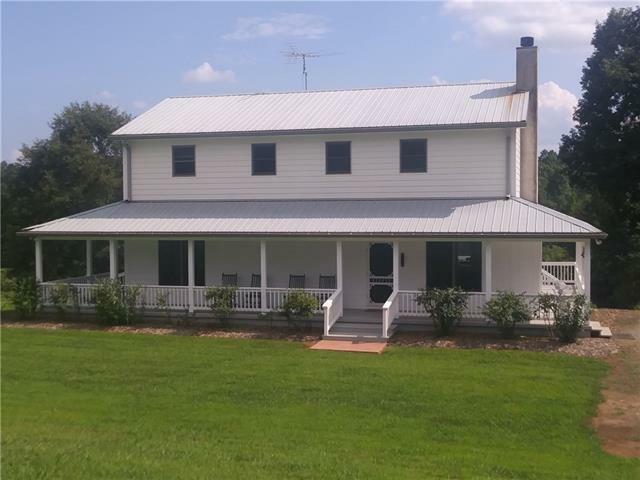 Beautiful, two-story 5 bedroom, 3.5 bath farmhouse with wrap around porch offers a peaceful retreat. Sit on the porch rail and pick blueberries from your own bushes during the summertime. Four of the bedrooms sit on the second floor with the fifth bedroom in the basement as part of an apartment suite with a living area and bathroom. The kitchen has plenty of cabinets, a pantry, and built-in desk area with file drawers. Family room has built-in desk area, cabinets and shelves adjoining a nice-size office with built-in bookshelves. Master suite has walk-in closet and bath. The home has both a heat pump system and woodstove. Rolling pasture land is fully partitioned by electric fencing into 5 grazing areas for your horses and livestock. Walking path goes around pasture and leads back to creek. Several outbuildings - barn with electricity and water, tool shed, lean-to shed and wood shed. Home has a vineyard, garden area, fruit trees and bushes. Picnic area with built-in table. A must see! Offered by New Direction Properties. Copyright 2019 Carolina Multiple Listing Services. All rights reserved.